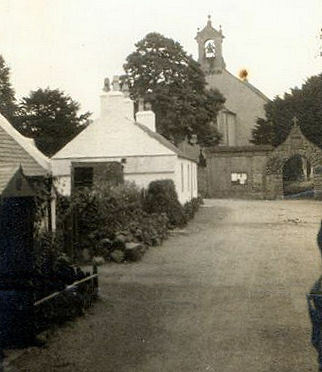 I have three pictures, probably taken in 1913, in Kirkmichael, Ayrshire.. The second picture has the handwritten inscription on the back "Jon Aird 81yrs. James Aird & wife." The third picture has the handwritten inscription on the back "John Aird (81yrs). James Aird his son." After some research, I determined the pictures were likely taken by my great-grandmother's half-brother Henry C. Patterson. Travel overseas by family members was unlikely after the migration, but one member was fairly well off, and found Henry C. Patterson on a ship returning to Canada, via New York: SS Baltic Liverpool arriving 1913 Aug 30. From this, I gather he took the pictures on a visit that year. Before I inherited these pictures or knew of their existence, I happened to have visited Kirkmichael in 1977 and, by coincident, took a picture of this street from almost the same location. I would be interested in determining the exact location of the pictures. The one showing the street is obvious, but what about the backgrounds in the pictures of the people? My AIRD ancestors came from Ayrshire. 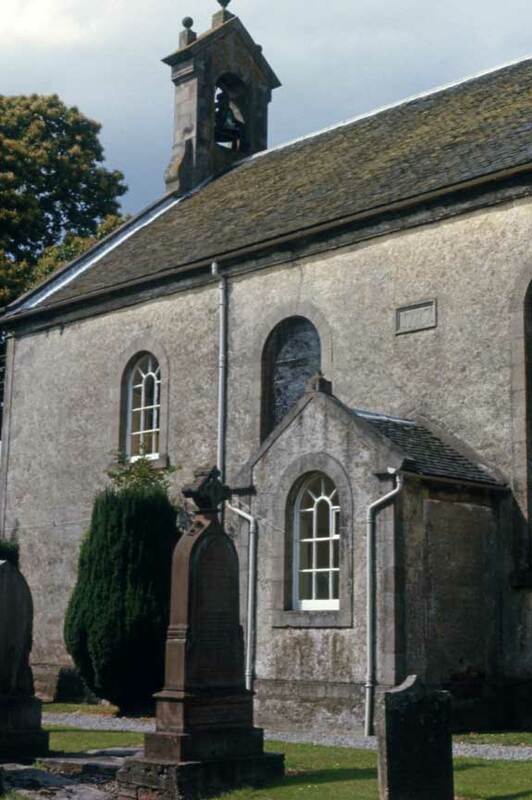 My GGG-grandfather William Aird married Mary Hunter at Kirkmichael 1806 November 14 and lived at "Mossend." 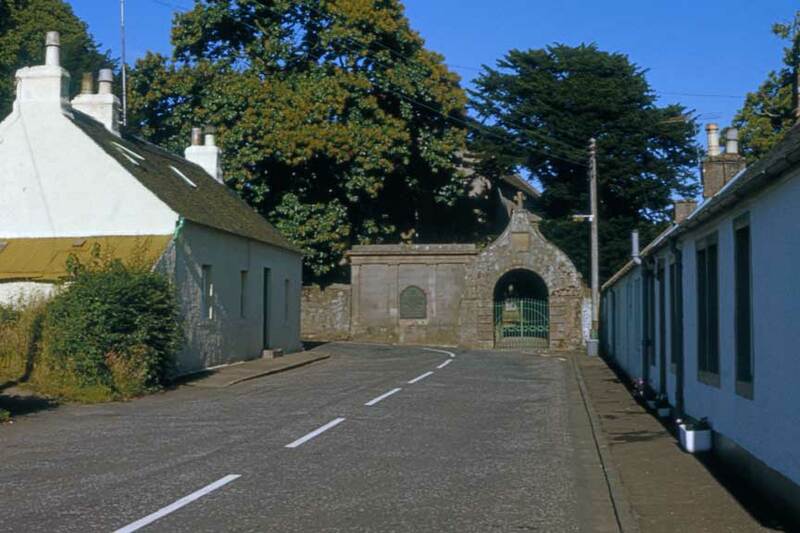 I have not been able to verify the exact place and date of the birth of William Aird, but it appears he was born about 1783, possibly in Kirkmichael, but also possibly in Kilmarnock and may have been in Straiton at one point. He and his family migrated to Montreal, Canada in 1829. I estimated the year of birth 1783 from his age stated at burial in Mount Royal Cemetery in Montreal. I have done extensive research on the Aird family. However, I cannot identify the Aird's mentioned in the inscriptions on the back of these pictures. I suspect they were cousins of my great grandmother Isabella Aird. I have searched parish records on microfilm and other available records on the internet, but there are some gaps in the family information. I am particularly interested in AIRD records, but also HUNTER. I determined the parents of Mary Hunter who married William Aird were David Hunter of Mossend and Isabell Anderson. 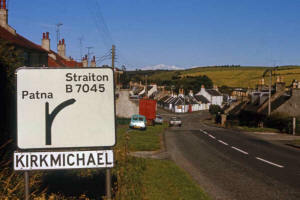 Since I wrote the above, I scanned the slides taken during my visit to Kirkmichael in 1977 and also researched records to identify the people in the pictures. In these 1977 pictures, note that one was taken of the gate to the churchyard from almost the same location as the earlier one. This was a coincident, as I was unaware of the existence of the earlier picture when I visited. The caption on the earlier picture indicates that the house where "mother" (my great-great grandmother Isabella Aird) was born is on the right but outside the picture. My picture shows that area but, unfortunately, it appears the original structure was removed and new row housing replaced it. The house on the left appears to be the same structure. Searched records for John Aird who may have been 81 around the time the picture was taken and who had a son James. 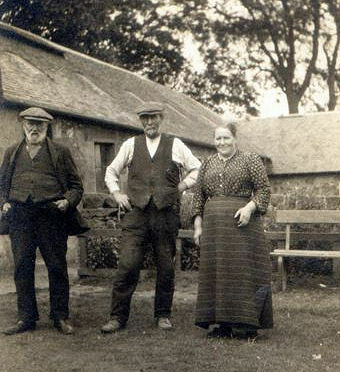 I found only one possibility that matched: John Aird, Blacksmith, who was born at Kirkmichael in 1827 who married Margaret Crawford McMeeken there in 1850. John died in 1914 and Margaret in 1910. They had at least four children, the youngest being James Aird born in 1857 who married Mary Wyllie at Maybole in 1883. He died at Kirkmichael in 1942. 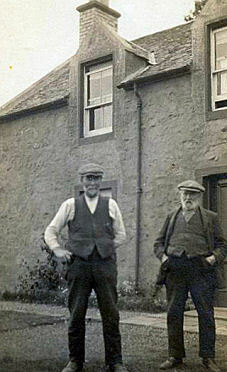 If John Aird was 81 when the above picture was taken, then that would indicate it was taken about 1908. That's five years earlier than my original estimate of 1913 when I discovered Isabella Aird's son Henry C. Patterson was on a visit. Searching for other possible children who may have made a visit, I found a daughter of Isabella, Mary Patterson/Watson visited the UK in 1907. I found her on the Empress of Britain from Quebec to Liverpool in 1907, arriving August 4, but was unable to find her on a return passenger list. Perhaps she stayed a year, as John Aird would have been 81 in 1908. I know she was back in Canada by 1911, as she appears with her family in the census of that year. I still cannot link John and James Aird to my family tree. But I assume they are related since my North American Aird relative visited them during a trip a century ago.